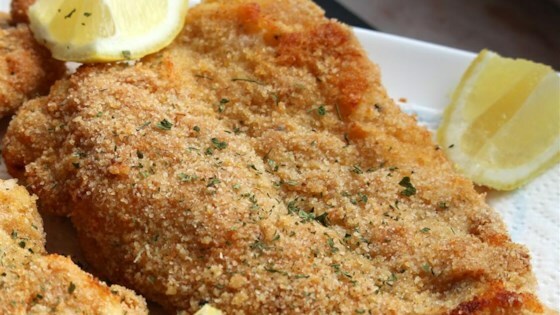 how to cook chicken schnitzel? "Growing up, chicken schnitzel was a classic. I decided to make this dish oven-friendly using less oil, and an easier cleanup. This dish tastes great with potato salad, or mashed potatoes and a nice crisp salad. Tastes great the next day cold too! It's a family-favorite! Enjoy with fresh squeezed lemon juice." 1. Preheat oven to 425 degrees F (220 degrees C). Line a large baking sheet with aluminum foil and drizzle olive oil over foil. Place baking sheet in preheated oven. 2. Flatten chicken breasts so they are all about 1/4-inch thick. Season chicken with salt and pepper. 3. Mix flour and paprika together on a large plate. Beat eggs with salt and pepper in a shallow bowl. Mix bread crumbs and lemon zest together on a separate large plate. Dredge each chicken piece in flour mixture, then egg, and then bread crumbs mixture and set aside in 1 layer on a clean plate. Repeat with remaining chicken. 4. Remove baking sheet from oven and arrange chicken in 1 layer on the sheet. Drizzle more olive oil over each piece of coated chicken. 5. Bake in the preheated oven for 5 to 6 minutes. Flip chicken and continue baking until no longer pink in the center and the breading is lightly browned, 5 to 6 minutes more. An instant-read thermometer inserted into the center should read at least 165 degrees F (74 degrees C). Per Serving: 383 calories; 9.1 g fat; 40.2 g carbohydrates; 33.1 g protein; 127 mg cholesterol; 810 mg sodium. how to butterfly a chicken breast? how to cook jacket potato? how to make sloe gin?